Articles > Write > Summer at a Real Ranch! At first the whole idea seemed almost impossible but in reality a road from intentions to the trip itself took merely several months. As it turned out, J-1 visa that we get to participate in work&travel program allows you get a job of not just a waiter, beach-rescue or photographer but also, for instance, a wrangler. Sure enough, for that you’ll have to put some efforts into looking for job offers yourself and some experience of working with horses won’t hurt. Then again, it doesn’t have to be as huge as it may seem at first because ability to share culture coming from the other side of the world with guests of a ranch is as important as horse-saddling skills. 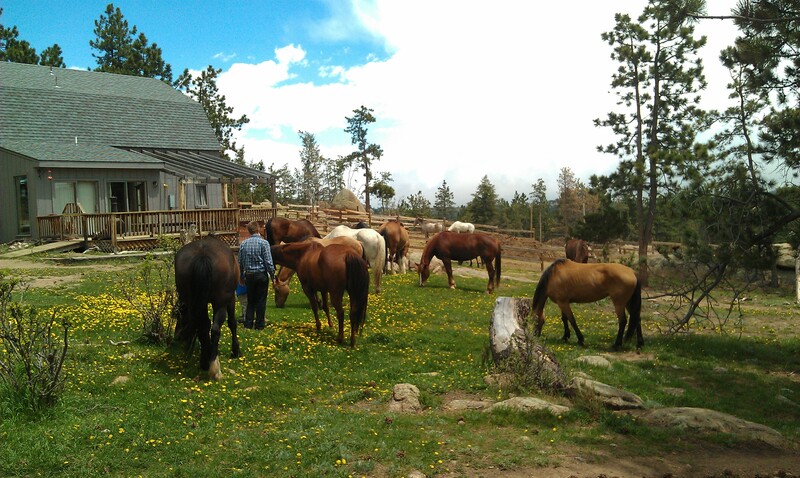 Sundance Guest Ranch is located on the border of Roosevelt National Forest that is located in about an-hour-and-a-half’s car ride in north-western direction from Denver. That is, towards Rocky Mountains. No public transport let alone own feet will help you get there. And it is rather an advantage because inconspicuous gates – by the looks of it – hide a special world behind them where it is nice to have rest from rush that is so common for places of mass gathering. But nothing is left of it inside. On a pretty large territory (should you have a ride along its perimeter in walking pace, it will make for a have-an-hour’s trip), its owners live – an elderly couple as well as their numerous pets: about forty horses, two donkeys, hens, cats and a dog. There are also people who come there to stay for money to a hotel or just as friends. Interestingly, dogs at the ranch aren’t only allowed to accompany their owners during vacations but also to enter all the premises – unlike cats, that are less lucky. While we consider them more pets than dogs, at the ranch their habitat is limited to a barn. No discrimination – simply cats catch mice and more often than not walk on their own, and people there remember it. Sure enough, care of extensive household takes employees. And in summer significantly more of them are needed because in May to September about two dozens holiday-makers come there a week, oftentimes with children – and all of them need to be fed and entertained. Therefore each summer “seasonal employees” gather at Sundance – young people from different states and even various nooks of the world. Owner by the name of Dan is already accustomed to unusual names and accents because he has to pick up about half of his employees at Denver airport after long flights. Alongside Americans and me, back then a Ukraine-born student of art criticism department, boys and girls from France, Switzerland, Germany, United Kingdom and Jamaica worked. And a year before that Dan and Ellen’s guests could enjoy funny accents of employees from France, Ireland, Slovenia and Belarus. It goes without saying that under such circumstances it is a win-win situation and we mean far more that just financial gain. It is hard to give a translation of a “lifetime experience” notion without attempts to launch into colorful explanations. In broad lines, it is this unique experience that you’ll remember for your entire life. This is what Dan and Ellen, owners Sundance Ranch, promise their seasonal workers. And they keep their promise. First days at the ranch are a bit of a trail for city dwellers, though. It will just suffice to mention a “scare-bear” before the kitchen door that basically represents an ordinary plank about a meter wide with sharp nails. The word is that employees forgot to put it for the night once and got a payback in the shape of a visit of a bear that gutted both refrigerators and destroyed almost entire stock of sweet honey flakes. However, you get accustomed to such neighborhood very fast. In reality deer, elks and bears at Rocky Mountains turn out to be pretty polite and not too sociable so an encounter with them is more luck than commonness. Nevertheless, during horseback walks at the national forest many managed to watch for at least several minutes something wild and interesting. In most cases this several minutes were just enough to make blurry pictures for them to be later sent to acquaintances with amazement. Practice has proven that vacation at a ranch is full of sources of elation. There is a good reason why they in the USA shell out substantial amounts of money for it – from 1800$ a week. This includes comfortable accommodations, filling (or the way it is called there “hearty” – coming from a heart) nutrition and rich leisure program. Alongside daily horse riding, guests are offered shooting from various kinds of weapons including bows and even tomahawk throwing, extreme rafting, mountain climbing, swimming in a pool with horses, board games, billiards or simply a pleasant chance to lie in a hammock with a book from a huge rack where one can even find translations of Dostoyevsky and Tolstoy. Many people come there with their dogs and have walks in surroundings. In this case they are sure given a whistle not to get lost due to lack of habit and suggested to take water with them. Water is especially important there because high in the mountains dehydration comes surprisingly quickly for people new to the site. And one the most important tasks of an instructor is to remind about that. And here we refer not so much to tourists of the ranch but to those who create conditions for their relaxation. Work team at Sundance is traditionally not that large – only about fifteen persons. When meeting a newly-arrived guest, each tells own name, native country or state and position with an unfailing addition “but in fact, I do everything”. And it really is so because wranglers are taught to be instructors in shooting, maids and assistants in the kitchen; guys are also trained to be lumbermen because plan on dried-up trees clearance isn’t smaller and maybe even larger than the one in horseback walks. With such an arrangement job is always done and nobody gets critically tired of routine tasks. It is hard to imagine how a wrangler can ever get tired of riding in the mountains and cheerful talks with numerous guests, though. Pretty much first thing that I told my mother on the phone the next day after arrival is something she remembered for a long time: “Mom, do you know what I am doing right now? Drinking beer in Jacuzzi!” And then I added something to finish off her being-a-mother worries: “They cook so tasty there that I could work for free.” In a certain moment our seasonal team positively agreed that employees get more pleasure than guests. Because these are people who have a chance not just to live their dream and do labor of love, they also receive salary for it. It was giving such an enormous surge of energy that after dinner, when official program for guests was over and they headed to have rest after a busy day, thing only began for employees. With the closest bar around being located about 10 miles away from the ranch and on foot one can get as far as to a bear’s den, it makes you be especially inventive when it comes to entertainment. Fortunately, Dan and Ellen, who promised lifelong experience, allow using not just Jacuzzis in free time but also spare cars. Thank to that amazing opportunities uncover before those having swimming suits and driver’s licenses combined with skills of driving on the right side of the road (a girl from the UK and a boy from Jamaica were unlucky to be listed as passengers for the entire summer). Making friends worked out not just with colleagues, naturally, but also with the majority of guests. Because when you spend all your time with people, even for a week, but in a pretty confined space, it doesn’t go without a trace. Dozens of stories told got recorded on films of memory to produce trust and warm relations. After the season was over, I even went to visit one family in Boston whose children I taught to ride. But it is a different story. As to American ranch with its horses and cowboy hats, if asked if I wanted to go there again, I would answer “Yes!” without a shadow of doubt!